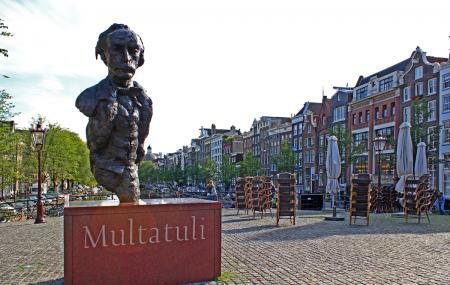 Find hotel near Multatuli Museum In Amste ..
Multatuli Museum in Amsterdam is a museum dedicated to the most celebrated Dutch writers. The museum is small and modest in its sense and is one place every literature lover should visit. The museum very intelligently displays the history of Netherlands and has some great artifacts that you can see in the destination. The museum also covers many aspects of the writer’s life and displays them in many forms. Take a tram from amsterdam, Nieuwezijds Kolk. Small quirky indy museum devoted to the Dutch writer Multatuli (Eduard Douwes Dekker). It shows some of his furniture, including his writing desk and the couch on which he blew his last. On the ground floor many editions of his work. Multatuli’s most famous novel is “Max Havelaar”, an indictment of the Dutch colonial regime in Indonesia, which has world-wide been claimed by both the left and right of the political spectrum as supporting their cause. The curator offered me a private tour, which was most interesting.